Don’t worry too much about how you look. Spend more time thinking about what you’ll say and how you’ll say it. But even so, put on some pants, perhaps. Those are the conclusions reached by a Zogby Analytics survey seeking to understand why people don’t like video conferencing, and how to improve it. Despite an increase in remote work and video conferencing, the survey found “that majority of working adults do not feel comfortable on camera,” and plenty had gone to great lengths to avoid it. The primary reason for people’s distaste, unsurprisingly, is that most video conferencing technology still doesn’t work all that well. The second reason is that people are camera-shy. 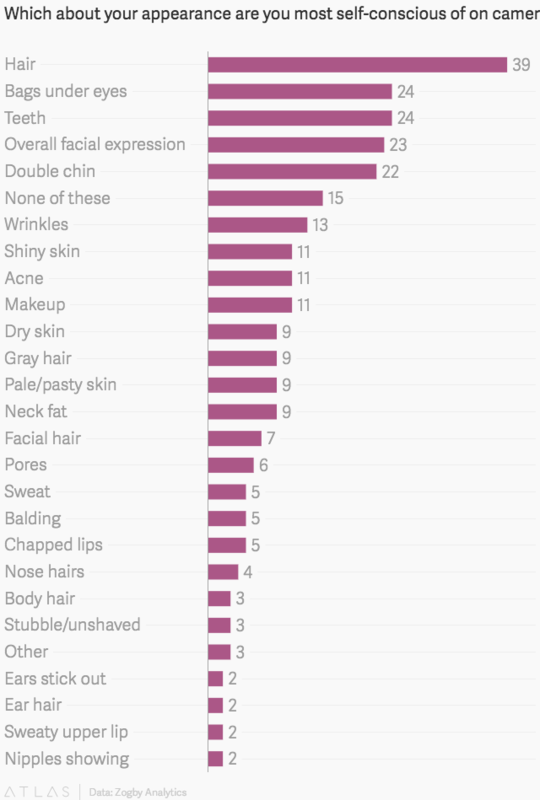 ”There seems to be this overwhelming obsession with our appearance,” said Kelsey Nelson, a spokesperson for Highfive, the video conferencing service that commissioned the survey. Nearly half of respondents (48%) said they were more worried about their appearance during a video call than the content they were presenting. About a third spent more time primping than prepping. That’s likely because people see themselves as less attractive on camera. Although respondents rated themselves an average of 6.4 on a attractiveness scale of 1-10, people’s self-assessments dropped to 5.57 when grading themselves on camera. Their worries were legion. Of course, there were a few who let their standards of personal appearance slip during video conferencing. Of the 800 Americans in the random sample (selected to represent a range of ages, genders, positions, and income levels), one out of ten respondents said they had not put on underwear, pants or bras during video calls. Most of their colleagues apparently didn’t care (or just didn’t notice). 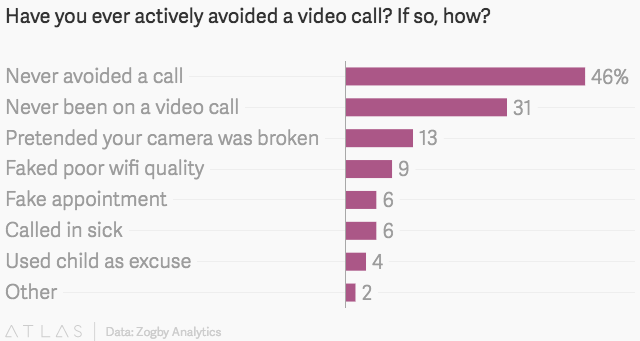 When asked what annoyed them about people on video calls, the majority of respondents said “nothing.” For those who did answer, appearances mattered far less than actions in their assessment of others. ”At the end of the day, people don’t care about what you look like, it’s about what you do,” Nelson said in an interview. Still, people mentioned some pet peeves. The top offending actions were eating and drinking during a call, not paying attention, background noise, heavy breathing, and sitting too close to camera (C-suite executives were especially annoyed by this). 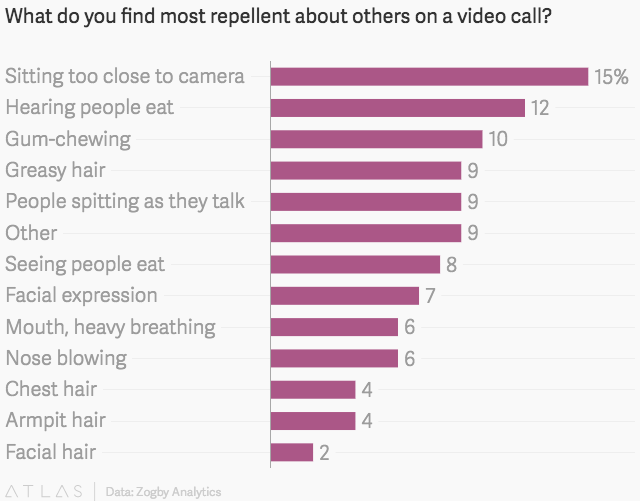 Demographics seemed to affect people’s view of video conferencing. Among those born after 1980, camera time was no big deal: 57% said they felt comfortable on camera, compared to just 32% and 17% for the age groups 35-54 and 55-69, respectively. Older people were more likely to cite issues of privacy, self-consciousness, and feelings of unattractiveness. More men (46%) said they enjoyed being on camera than women (26%). Among younger respondents, 30% reported wearing pajamas during calls. Highfive’s CEO, Shan Sinha, didn’t seem too concerned about video conferencers’ lackadaisical habits. He wrote by email that businesses should use video as a way to improve communication, not replicate in-person meetings. The keys, he wrote, are tools that can capture a whole room, not just a face, and give people simple privacy controls to manage their cameras. He also suggested minimizing one’s own feed on the screen, so that one can pay attention to the meeting itself: 30% of survey respondents who had used video calls said they spent half their time looking at their own faces. The image above was taken by Narek75 and shared under a Creative Commons license on Wikicommons.